It is an infallibly defined article of Catholic faith that the existence of God is rationally demonstrable. 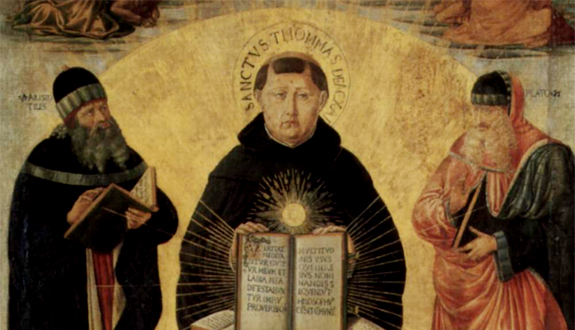 Hence, Aquinas presents five proofs for God’s existence in the Summa Theologica, which are often called “the five ways”. He also offers others proofs in other texts, such as De Ente et Essentia and the Summa Contra Gentiles. This argument uses the word “motion” in the broad, Aristotelian sense of “change”. A rock falling to the earth, water freezing, a plant growing and a child being conceived are all cases of “motion”.The argument speaks of “potentiality” and “actuality”. For Aquinas, again following Aristotle, all physical beings are composed of potentiality and actuality (matter and form). Potentiality means potentiality for something – a rock in mid-air is potentially on the ground, water is potentially ice etc. Motion is the actualization (becoming actual) of something that is initially only a potentiality. Because moving and being-moved are simultaneous, we must not imagine that Aquinas here has in mind a regress of movers back in time. All of the movers in this regress exist, and act, simultaneously. The example of the hand moving the staff underscores the fact that the regress of movers does not go back in time. Aquinas is not saying that, millions of years ago, there had to be some first mover who “kick-started” all subsequent motions. In fact, he does not believe that an infinite regress back in time is necessarily impossible. It isn’t immediately obvious that Aquinas has proved the existence of only one Unmoved Mover.